I’m not sure when I first whispered this plea to the Lord, but it must have been one of those times we parents face often, a moment dripping with fear and anxious thoughts. Six small words slipped off my lips. Little did I know how they’d be a constant companion to me in the following days and, I am sure, the coming years of raising my children. Fear is a too-familiar companion these days. It lurks around every corner, hunching behind news headlines and scattered throughout social media feeds. Hate, evil, sickness, and death prevail. How are we to walk forward in the brutal knowledge of all that surrounds us and our children? It was thoughts like these that weighed on my soul when I first whispered that six-word prayer. With that starting declaration—You have—we remember that God has been good. He has been faithful. He has been wise. We trace our memory back to the exact moments when He has come through on our behalf and for the good sake of our child. Just as Joshua and the Israelites set up Memorial Stones after God miraculously brought them across the Jordan River, we have our own Memorial Stones. I think back to the time our two-year-old ran across a busy street without us knowing. Our eyes were not on him, but God’s were. Or the time I walked into the hospital with early contractions, only to stay overnight and have the doctor nearly take our baby out via an emergency C-section at thirty-three weeks. None of us knew what was happening. But God did. He was in that room with us. And He delivered us out of the chaos, our little girl still safe and snug within my womb. Of course, like the Israelites’ voyage across the Jordan, our own journeys as parents are not without shadows. Sometimes our fears do materialize. In the weeks and months following the miscarriage of our fourth baby, I found myself asking why this tragedy was a part of our story. Why did we lose our child? And yet, God was there. He entered into our grief. He did not shy away from it or from us. He did not leave us in our wanting and questions. He entered into the ugliness of it all, right where we needed Him. Sometimes when we look back over those Memorial Stones, the shadows are plentiful. The hurt is deep and aching. But behind a shadow is always a source of light, and in merciful moments that light eclipses the shadows, breaking through and reminding us: God is faithful. He has a greater plan for the narrative of our lives. He will never leave or forsake us. We recall the Memorial Stones in our lives, and we see it: He has. He has been there. His history of faithfulness is rich in kindness. The Lord stopped them and told them to sink their feet deep into the magnitude of this moment and set up something physical to remind them of what had taken place. “Let this be a sign among you,” Joshua instructed the people as they gathered stones, “so that when your children ask later, saying, ‘What do these stones mean to you?’ then you shall say to them . . .” Their stones were meant to spur on the conversation about God’s faithfulness. Despite our fears, we can exclaim with King David, “Oh, taste and see that the Lord is good!” (Psalm 34:8). We find power in Christ to rise above difficult circumstances and trust that God is good and kind toward us. As David says, “Your steadfast love, O Lord, extends to the heavens, your faithfulness to the clouds… How precious is your steadfast love, O God! The children of mankind take refuge in the shadow of your wings” (Psalm 36:5, 7). Resting assured in God’s history of faithfulness and finding peace in His everyday kindness, we can walk forward confidently in His promises. We know that He will care for us and our children in an uncertain world. We can cling to the words He spoke to the Israelites, which ring true for all of us today, “Fear not, for I am with you; be not dismayed, for I am your God. I will strengthen you, I will help you, I will uphold you with my righteous right hand” (Isaiah 41:10). And so, fellow parent, if fears and anxieties tempt you to despair—don’t. Do not despair. Just speak those six simple words over yourself and your children, yes, as a plea, but more as a reminder to ourselves. He has. He is. He will. 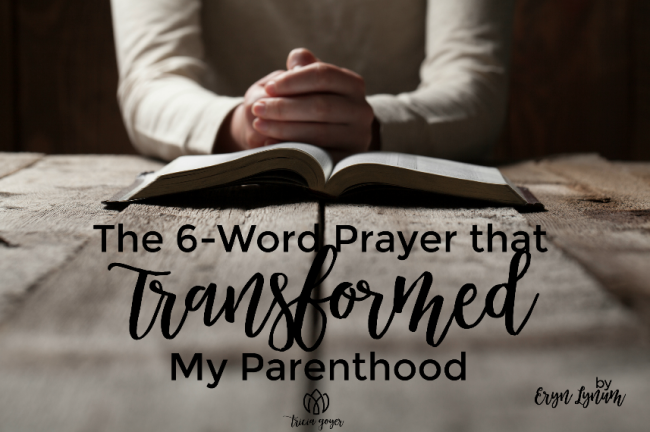 This 6-word prayer transformed @erynlynum’s parenthood. 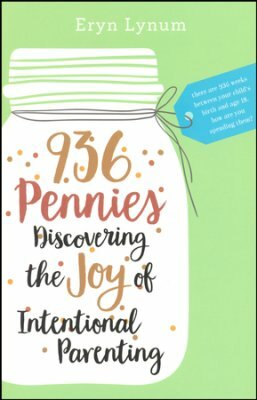 Read on @TriciaGoyer + enter to win a copy of 936 PENNIES. 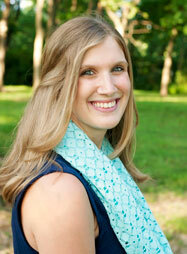 Eryn Lynum is the author of 936 Pennies: Discovering the Joy of Intentional Parenting. She lives in northern Colorado with her husband and three boys and baby girl, where they spend their time hiking, camping, and exploring the Rocky Mountains. She loves to travel and share at conferences, churches, and writers’ groups. But every opportunity she gets, she is out exploring God’s creation with her family and sharing the journey at www.936Pennies.com.